Harley Loco: A Memoir of Hard Living, Hair and Post-Punk, from the Middle East to the Lower East Side is a gut wrenching memoir written by Rayya Elias, a former drug addict. Born in Syria, a young Elias migrated to the U.S. with her family only to discover that life in the promised land was not what she’d envisioned. Fueled by feelings of inadequacy and classmates who bullied her, Elias’s began to spiral downward with every passing year. She eventually became a hard-core drug addict who ended-up in prison. This story is sad, disturbing, and in the end, redemptive. I found it emotionally difficult to read, shockingly graphic, and disquieting. I came away from this memoir wondering if Elias ever came to fully comprehend the root of her many problems. I am glad however, that she has overcome her addiction and that her life is on a much better path. It could not have been easy for her to write her story with such honesty. It is my hope that in the writing, deep healing happened. 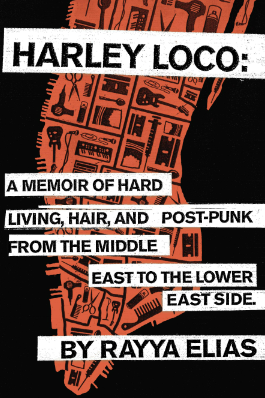 This entry was posted in Uncategorized and tagged Books, Detroit, drug addiction, hairdressing, Harley Loco: A Memoir of Hard Living Hair and Post-Punk from the MIddle East to the Lower East Side, memoir, NYC, punk rock, Rayya Elias, Syria. Bookmark the permalink.